In addition to basic kitchen utensils and equipment designed for canning and preserving, there are other specialty items that save time when canning and preserving foods. Although these items may not be absolutely mandatory, they’re certainly nice to have. Food processor: Purchase the best-quality food processor you can afford. It should be heavy and sturdy so that it doesn’t bounce around on your kitchen counter as it’s processing away. 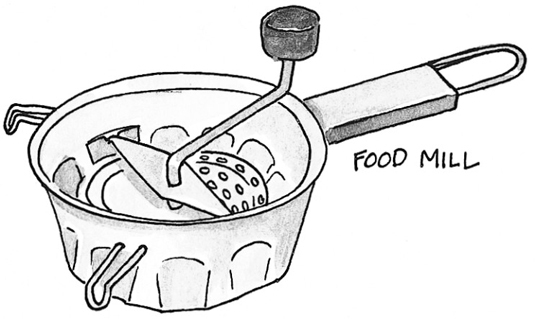 Food mill: A food mill purées fruits and vegetables as it removes the peel and seeds. You accomplish this by manually cranking the blade, which forces the pulp through the mill. Look for a food mill that rests on the edge of your bowl or pot, which enables you to use one hand to stabilize the mill while you crank the blade with your other hand. Blender: A blender purées fruits and vegetables in a hurry, but you need to remove the peel and seeds first. Be cautious of incorporating too much air into your food. Food scale: A food scale is essential when your canning recipe lists your fruits or vegetables by weight. 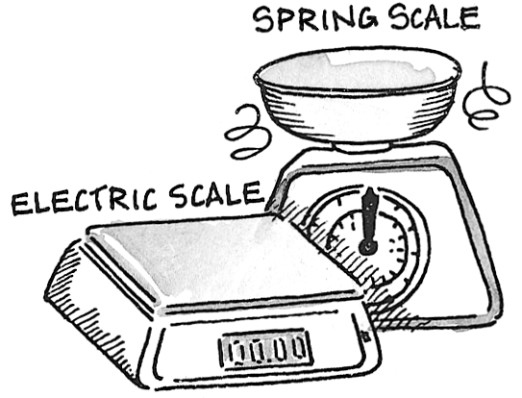 The two most common types of food scales are spring and electronic. A food scale with metric quantity markings makes converting recipe ingredients a breeze. A spring scale (sometimes referred to as a manual scale) allows you to place a bowl on the scale and manually adjust the weight setting to 0 before weighing your food. After placing your food on the scale, read the indicator on the dial to determine the weight. An electronic scale is battery operated with a digital readout. It’s more costly than a spring scale but easier to read. Look for one with a tare feature. This allows you to set the scale to 0 if you add a bowl to hold your food. If you have a choice, choose an electronic or digital scale. Vacuum-sealing machines: A vacuum sealer is the most efficient appliance around for removing air from food-storage bags. Use vacuum sealers for packaging dried foods or for storing raw or cooked foods in the freezer. Although it takes up room and can be costly, you’ll realize its full value after you own one. New on the market are hand-held vacuum sealers. They can provide a less-expensive alternative to purchasing an electric version.